The victim explains: "The word is Tshalach which is hebrew and means that my spirit is growning for more of the holy spirit." And how did she acquire said word? By switching her keyboard to Hebrew mode and typing in the English letters. Hell, we've seen it all before. The result, as you can probably guess, is total nonsense. There's a lesson here boys and girls. If you aren't coherent in your own mother tongue, do not attempt a tattoo in a foreign language that you don't know. Also, don't do drugs. I urge you against getting this tattooed on your skin, as it's just a mundane word, it carries no special meaning. It will carry no special meaning to one who does not understand the weight of the Spirit of God. Tishalach, T'Shalach, however it is spelt, is a word or phrase, that to a person who knows of God's Spirit, desires it. And your friend or whoever that person was, was probably referring to a "groaning" as opposed to a "growning". It won't mean anything to one who doesn't have a relationship with the Giver of Language. AMEN!!!! Say that! This word, Tishalach, T'Shalach, however it is spelt carries heavy weight to a true believer who is in relationship with God for real! Well said, @ cr8iveworship. Nope, sorry. I'm not impressed by modern day prophets who invent their own Hebrew words and give them obscure meanings. This is the first time I see your Blog, and it's funny! I'm impressed by your didactic effort to teach. But I believe you have a mistake in this one: the word that is referred in Tshalach is שלח (pronounced SHA-LACH) as in שלח את עמי (let my people go). This is the command "let go" as in the biblical story of Moses and Pharaoh, while תשלח is, as you mentiond, the future term "you will let go" and is not suitable here. There is the T, though. Shalach has no T. Then again, you might be right, maybe that priest guy warped the word by adding a T.
The t was added because to an English speaker, a Hebrew Shalakh sounded like "Tshalakh". It's comparable to "Djinn". Now, had he used "Shalakh" as the tattoo, this would've become an Ez/Oz, as the word is also Hebrew for "osprey". תשלח, in third-person, future tense could also mean "she shall send forth". To be fair, it appears she doesn't know how to write in English either. This word can be taken as you wish. Whether you will agree with it that is seen as a different perspective. The word simply means "you will send." Rightly as someone said that this is mostly referred to Christians or people who just generally believe in Christ. But then the level of understanding in the word and how far you take it depends on your personal relationship with christ. If you are not a believer then I don't think it's fair to discriminate a word that is used by a believer. Obviously if the word does not apply to you or you think the word is 'crap' or rubbish then that's you, but this word is evidently directed to believers, and I think we should all just respect that. We all have different beliefs, even if it's to not have a religion, still you are believing in something! Bless. I just feel that I need to chime in here. I am the owner of this tattoo in the picture that you are trying to bash. First of all, who are you and do I even know you? How do you think that it is OK for you to go on my facebook page and take MY picture and try to persecute me for something that you obviously know nothing about. But, I AM OK WITH THIS! My Bible tells me to "count it all JOY when man speaks all manner of evil against you for MY NAME SAKE." I am praying for you, that your eyes are open and that you can be able to experience TSHALACH for yourself! There is nothing else that satisfies! Who are you to judge me and say that what I experience is not real? By the way, my english is impeccable and I do NOT take drugs! GOD BLESS YOU and may you find peace in him and him alone! I was just made aware that this was here and I feel that I need to chime in as I am the owner of this tattoo. It really bothers me that you think that it is OK to go onto my facebook page and take my picture and try to use it to BASH me. However, my Bible tells me "count it all joy when man speaks all manner of evil against you for my name sake!" My prayer is this...that you arrogance and ignorance will be used to spark an interest in others that read your little page to want to know more of the holy spirit! I am praying that you can truly know the giver of TSHALACH, and experience it for yourself! There is nothing that compares to it. My spirit is truly groaning for more of the HOLY SPIRIT, it is what sustains me and moves me through life day to day! My prayer has always been that I could make a difference in the lives of others. I view this as my chance. I pray that it starts with you and spreads to all who read your page. For the record, my mother language of English is impeccable and I do not now, nor have I ever taken drugs!! Blessings in the name of the giver of Tshalach! Okay, whether Tshalach means something to you or not, and all this groaning stuff, this is really none of my business. 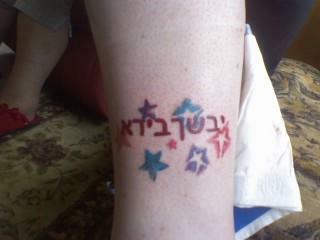 However, if you think your tattoo actually says Tshalach, you're sorely mistaken. That is because Hebrew letters aren't just for decoration, and switching your keyboard to Hebrew to type a word in English letters is a very stupid thing to do. From what I read, the inspirer of Christianity was a scholarly fellow; he impressed the higher-ups at Hebrew-school already at the 'newbie' age of 12. Told them "Verily, dual-language keyboards are not simple letter-substitution plastic gizmos." And also "Ye who rush to post un-checked tat-pix on Mine-Space should be aware that once 'out', they may oft be noticed by the Informed, and commented upon, even unto Rebuke." What are you people trying to say? That because you have the holy spirit you don't need correct grammar? This is too funny. Language is language, unless It's a dead language, it is constantly changing. Regardless if you name it Hebrew or gibberish, tshalach means what a collective group of people agreed it to mean. That goes for everything really: the symbols on her leg are just symbols. And it means what she wants it to mean. No point in being a jerk or declare yourself the arbitrator of Hebrew language cuz unfortunately you didn't create the language nor were you present during the creation of it. Just saying. Those scribblings on her leg are not "just symbols", they are letters of a real, living language. If I wrote "fgfsaafsghhj" in English and claimed it actually says "Son of God", it would still be a bunch of random letters and nothing else. I completely understand that I'm resurrecting a long since buried and decayed posting but cut me a little slack, it's new to me. I couldn't look myself in the mirror tomorrow if I didn't chime in here and tell you that, when I read "If I wrote "fgfsaafsghhj" in English and claimed it actually says "Son of God", I spit my Cheerios across the table in laughter. Everyone needs a good laugh now and then, thanks for that. Now, I might be too much of a beginner in Hebrew, but I don't see "Tshalach" anywhere in there. I see "YB(or V)SHCHB(or V)YD'" I currently require nikkud for reading so I can't imagine what vowels she had in mind. I Love you guys! I think you're all beautiful! It cracks me up how we are. I hope to meet you all some day in heaven. If not, GOD will have to wipe away my tears for you too. Shalom in Messiah Yeshua!